In an emergency situation, space blankets can be a life saver. In my opinion, every survival bag should have one. They’re cheap, take up little room and they weigh next to nothing. So what the heck is a Space Blanket? Originally designed by NASA’s Marshall Space Flight Center in 1964 for space exploration, today these reflective blankets have become an outdoorsman’s best friend. They are often included in first-aid kits, but the average person has little clue to how valuable they can be during an emergency. There are many variations sold on the market, but in general, they are often constructed from thin sheets of aluminum coated Mylar, and are designed to reflect a person’s radiated body heat. During an emergency, these lightweight blankets can be used to prevent and counter the effects of hypothermia. They can be used with insulation material to build a survival shelter or bag that will keep in the heat and use your own body heat to reflect heat back into your shelter. They are great for reflecting the warmth of a fire into a shelter. They can be seen from far away, making them a dual-purpose survival item that can also be used to signal for help. Titan is an American Veteran-Owned business that makes some killer Mylar Survival Blankets. They come individually packed in zip-lock bags, measure in at 52″ x 82″ and 12u thick, weigh only 1.75 oz., and are waterproof and tear resistant. 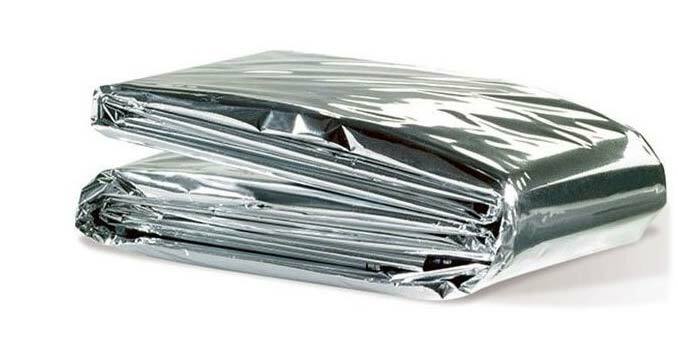 A number of companies have begun to rethink the traditional space blanket, and have started making heavy-duty versions that can double as an emergency tarp or sleeping bag in a pinch. Can be used to collect rain water. I think it can also be used to create a solar still.